Tame the American Continent! The Civil War is over! America strives to connect sea to shining sea with iron horses and steel rails, opening the vast untamed lands to millions of adventuresome citizens weary of war. This strategic railroad game extends from the muddy Mississippi to the coast of California. 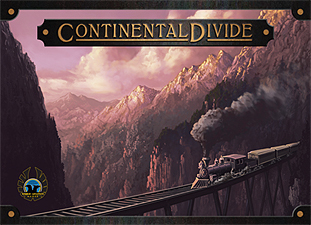 Each player takes the role of President of a Railroad, building across the vast plains, high mountain ranges, burning deserts, and dense forests of the Western US, crossing the Continental Divide! Continental Divide is not a game of luck or chance, but a competitive struggle of wits, savvy, and guile. Many decisions await the creators of these railroads, including what routes to build, how to capitalise, and what goals to set - both short and long term. This modern classic has all the challenges faced by the empire building capitalists that created a modern superpower.